The Edmonton Oilers are still trying to put their pieces together in a way that will win them some more games. After entering last season with Top 5 expectations, the Oilers were one of the league’s biggest disappointments. They continue to be. If you’re sitting 6th place in a division while rostering a guy as high-octane as Connor McDavid, it’s hard not to be considered a disappointment. It’s certainly not a knock on McDavid, who continues to do his part ten-fold for the Oilers, but instead on the rest of the team. That includes more than just the players in uniform. 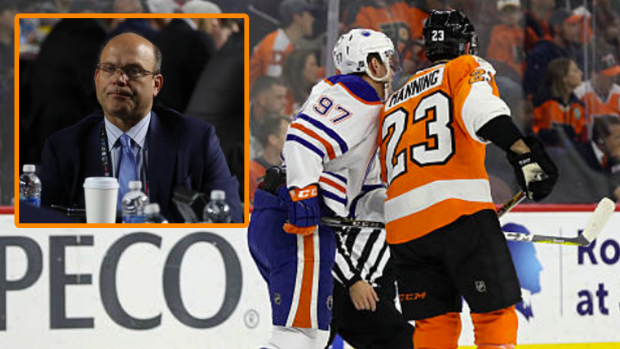 Peter Chiarelli is one of the most triggering figures in the NHL. Hockey fans, including the Oilers own fans, seem to have a constant bone to pick with the tenured Oilers GM, and his questionable decisions seem to keep piling up. From awarding bad contracts to trading away legitimate talent for not much return, Chiarelli isn’t making things easy on himself. So what’s another questionable decision?! If you don’t know the backstory, this doesn’t seem like a very significant trade. Sure, you may question why Chiarelli is trading away young talent for a low ceiling defenceman that seemingly has little to offer the Oilers, but overall it’s relatively “meh”. But the thing is, there is a backstory. There’s a juicy backstory. McDavid missed almost half of his rookie season due to injury, an injury caused by a questionable hit from Manning. The aftermath included many speculating that Manning delivered the hit with an intent to injure, although McDavid didn’t fully say how he felt. Well, at least not at first. In their first rematch, McDavid and Manning were at each other the whole game. Following the gritty match, McDavid told reporters that Manning was at him all game, bringing up the injury from the year before. McDavid, who is usually fairly soft-spoken and watered down when it comes to the media, didn’t hold back his ire. Just over 2 years ago, McDavid called Manning classless. Not only that, he went on to say that this game confirmed one thing that he hadn’t previously spoken on – that Manning did in fact injure McDavid on purpose. He said so with conviction and assurance. Oilers Management: Peter. No. Absolutely not. You cannot trade mcdavid or your fired. Chiarelli: Fiiiiiiiine. If you won't let me trade him then I'll just drive him out of here. Yes I'm sure they will have big laughs about how he bragged about blowing up mcdavid's rookie season and robbing him of the Calder. Hilarious. Caggiula was on a 20 goal pace too and Chia got waiver wire fodder as the return! You trade for the guy who hurt the best player in the league, likely with intent, for a guy who the best player in the league is close to. Pete Chiarelli, haha. I sure hope mcdavid stands up and starts talking. This is complete crap. Wow, they’re mishandling the best player in the league. Oilers lose this trade, over and over. It’s a little confusing why Chiarelli would make this move, as it doesn’t seem to be significant enough to justify bringing Manning in. It’s not like he’s been a huge difference maker on the ice, unless it comes down to getting under the skin of his opponents. The Oilers know very well just how good he is at that.